Detailed map of Nepal’s Royal Chitwan National Park, indicating various resorts, lodges and locations where different animals can be found, with enlargements for Narayangadh, Hetauda and Sauraha. The main map at 1:150,000 has contours, relief shading and spot heights, with colouring and graphics indicating different types of terrain and vegetation. 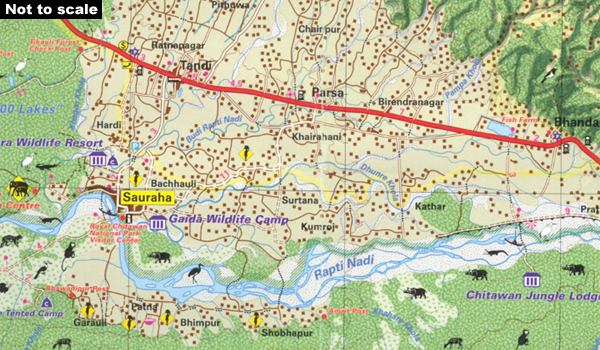 Road network shows access from Narayangadh to the park and other settlements. Drawings of local animals mark locations within the park where they are most likely to be seen. Other symbols highlight Tharu villages, crocodile and elephant breeding centres, tourist accommodation and various facilities including bicycle and motorcycle hire, fuel supplies, taxi and bus stands, etc. The map has a latitude and longitude grid at 5’. Map legend includes English. Enlargements at 1:25,000 show Narayangadh and Hetauba areas in greater detail and a plan at 1:10,000 of the parks main centre, Sauraha, indicates various accommodation facilities, restaurants, etc. Also included is a panorama drawing showing the peaks of central Nepal as seen from the parks, from Dhaulagiri in the west, across the various summits of Annapurna to Ganesh and Langtang.